The Pisces archetype represents the miracle zone. Let’s take advantage of the abundant Pisces energy to align our inner being and outer actions with the flow of life and love. This is a very Piscean new moon! In addition to the Sun and Moon, this pair is joined exactly with (conjunct) Neptune and Vesta. Mercury is also in Pisces at 29 degrees. We are swimming in a vast ocean of Pisces energy! Jupiter in Sagittarius squares the Pisces new moon. What does that mean? We are searching for the truth and trying to get clarity, but the way forward may not be clear at the moment. Jupiter in Sagittarius can be impatient. Mercury in Pisces can cloud the truth. So wait and stay tuned. Let untruths unravel. Avoid making assumptions and jumping to false conclusions. With time, we will see more clearly. Then we can make adjustments, take decisions, and move forward. For now avoid making unrealistic promises and entering into unknown territory without enough information. Good intensions are not good enough and can get us into as much trouble as over optimistic calculations. This is a good time to be open to insights from dreams and inspiration from meditation. Stay tuned to day-to-day living, and don’t get lost or try to escape into fantasies. The day before the Pisces new moon, Mercury goes retrograde, moving backward from 29 degrees Pisces to 16 degrees Pisces, when it returns direct March 28. Mercury remains in Pisces from February 10 to April 16. This two month period gives us an extended period of time to expand our intuitive awareness and tune into our heart. Because of it retrograde activity, Mercury forms three conjunctions with Neptune — (1) February 18, (2) March 24 at 17º, and (3) April 2 at 17º. The fuzzy watery influence caused by the close connection between Neptune and Mercury won’t completely lift until Mercury enters Aries April 17. During this time we are well advised to listen deeply to our inner guidance and to give our rational/thinking mind a much needed vacation. During Mercury retrograde, our left brain linear thinking is superceded by right brain feeling sensitivity. So don’t try to figure things out. Be with what is and try to gain a deeper understanding of what is going on. Things that are unspoken may come to the surface to be examined, clarified, and released. Unawakened Pisces can mistake passivity for surrender and get lost in addictions of all kinds. Immature Pisces easily falls into codependency, victimization, and martyrdom. Awakened Pisces represents the end of our journey, when we transcend the illusion of separation and awakened to the reality of oneness. The combination of Pisces, Neptune, and Mercury can boost our imagination, activate our intuition, and inspire all kinds of creativity. This is a great time to shift from identifying with (and indulging in) our problems to working with our gifts. But be careful, this combination can also dull our ability to discern between fact from fiction. This cosmic combo offers us a wonderful chance to go deep into our inner space and to be present in nonverbal communication with our soul, the universe, and each other. Vesta adds a special illuminating effect to the Pisces new moon. The brightest asteroid represents our inner fire or the sacred flame of our soul. When Vesta is present, we are assisted in awakening our inner spiritual pilot light, which gives us access to the voice of our soul and divine guidance. This full moon offers us a chance to connect to our hearts, to feel at one with the universe, and to trust the flow of life as it unfolds the divine plan. We can use this time to elevate ourselves out of our fragmented mind and to practice trusting what we hear when we listen deeply. Uranus moves into Taurus just hours before the new moon. We are put on notice that we need to change our values in relationship to our resources (both physical and emotional) to regain financial security and stability. The Pisces archetype is represented by two fish swimming together in a circle — tail to tail. Swimming in water gives us the experience of being in the flow. There are different ways to talk about the number two, but duality and polarities is the most universal and obvious. So let’s say the one fish represents our mind and the other fish represents our feelings. What state of our two fish — (1) mind and (2) body/emotions is the most conducive to being in and living our lives in the flow? To live in the flow (i.e. be in the miracle zone), our mind must be in its neutral channel, or have easy access and constant availability to the channel in our mind that is open, accepting, vast, and at peace. In its clear state, our mind is able to direct us toward our truth and awaken us to the light of our soul. When our mind is fixated on judgments and opinions, it leads us in directions that confirm what is ‘right’ according to those beliefs. Our mind can steer us off course and get us into a lot of trouble! We have all noticed! Our mind can create stress and resistance in our body. It does so all the time! It is difficult to relax when we are being pulled around in the muddy waters of a confused and conflicted mind. A clear mind opens the space for our physical and emotional bodies to be at ease in the cross currents of life. Our physical body must be in a relaxed state to align with our personal flow and the universal flow. This includes our emotional body, which must be adaptive, not reactive. In physical reality we must constantly be able to make adjustments to the ever-changing situations and energies. When we resist change, and thus make ourselves unavailable to be with the unfoldment of events, we create stress. Stress prevents us from aligning with the flowing current. When our mind is relaxed in its open clear space, the natural internal flow in our physical and emotional bodies awakens. The meditation section below contains ideas to create this experience in your Kundalini yoga and meditation practice. Aligning with and relaxing into the flow of life is the job of both Virgo and its partner Pisces. The function of these mutable., organizing energies is to create an on-going alignment in an ever-changing reality. Their job is never done. They are forever negotiating with reality and identifying openings and leeway. Virgo and Pisces are humble signs because they have nothing to prove. They simply wish to be with what is, and not be deflected from an experience that brings deep peace and contentment. They know that conflict and struggle disrupt our connection with the flowing force. They know that alignment is a subtle energetic experience that requires the right wiring and focus. Existential pain and suffering come from disconnection. Pisces uses consciousness (not thinking) to keep us tuned into the flow. This is work, not just relax and be a passive observer or spaced out in a dreamy fantasy world. We have to be aware of and feel the flow to stay in it. Think of being in a raft in the rapids of a fast moving mountain stream. We are not in control of the stream. To have our own idea of where we want to go is not only very hard, it is impossible. To not be overturned by the tumultuous waters, we have to keep our raft in the movement of the water. It will take us with it, if we are with it. It gives a harsh lesson in the necessity of aligning with reality, when we fight the commanding currents. To accord with the cosmic flow and the flow of life, we must release resistance, give up our need to be in control, and accept that ‘my way’ may not be the best way. The flow is the path, the Way. With no anchor in the body on Planet Earth, Pisces would be lost in the zone. Attentive to both our body and natural forces, Virgo helps us steer our ship/raft with precision. Virgo gathers the necessary information, makes the calculations, and determines each move. We need Virgo’s vigilant attentiveness to know and befriend the currents of life and to stay on course. Virgo gives value to physical reality, to our health, and to our bodies. It monitors how the elements impact our mental state and how our inner state impacts our physical being. Virgo keeps us from escapism, denial, and irresponsibility by helping us identify physical and life style causes for our dis-ease. Virgo is an undercover agent, not a cover up agent. The deeper essence of Virgo is about our spiritual practice, which ultimately leads us to a conscious in-the-body experience of divine order in our own lives. Virgo instructs us in both physical yoga and meditation. Physical yoga makes it possible to feel energy in our body and to release resistance, blocks, and stress. With both the physical postures/movements and mental focus, we align our body and clear and awaken the pure space in our mind. Both our body and mind must be unencumbered to create a dynamic alignment between the two. Entering and living the miracle zone is a long game. Our goal is to awaken to an expanded dimension of reality that is right here, right now. We don’t have to go anywhere. And when we get there (here), we wonder how we missed it for so long. We are not looking for substitutes that keep us attached to our current way of living, which in many ways will continue. A veil is simply lifted, and we see life differently. Somehow we have to do what it takes to not hold on so tightly to what we think we need and try so hard to keep things the way they are. We have to get over thinking that we will lose. We have to trust that the big game is set up for us to win. We have to trust that there is another way, another reality where we can relax, let go, and find Love. Three keys help us relax into the flow. The key to releasing stress and resistance is to go deep enough in neutral feeling awareness until we connect with and relax into our own flow, which links us up to the universal flow or divine order. Until we can get into this miracle zone, we will always experience stress, conflict, and struggle, which is determined by our level of resistance, non-acceptance, and desire to have things be different than they are. Control is a tricky term because it has many meanings. We are obviously not in control of the universal flow. But we have to control/focus our mind so we can access it. We must train ourselves to use our mind and body to link up with the flow. Without serious focus, which awakens consciousness, we can’t get deep enough to find what we are looking for. When our mind is consciously aware in its open clear space, the natural internal flow in our physical and emotional bodies awakens. We can create this experience in our Kundalini Yoga and Meditation practice. Let’s try it! The following sequence can be done with any Kundalini Yoga exercises or kriya and meditation. Attentive long deep breathing is very effective in pulling us into both our neutral space and rhythmic flow. The Jod Kriya below is a good one to awaken our inner heart/mind space. Go first to your neutral channel and stay present to the open, dark, empty space. When your mind is anchored in neutral nothingness, feel your body and your breath breathing in your body. Keep focusing on neutral in your mind and stay present to what is happening in your body. Stay aware of what you are feeling until you feel a shift. You cannot rush to this experience. Be patient and present to what you feel in your body, especially your abdominal area. A layer of stress will release, your body will relax, and you will feel a calmness inside. At some point you will feel an aliveness and peaceful flowing movement deep within. Micro-manage how you feel while doing the Kundalini Yoga exercises. Can you move with fluidity and pleasurable rhythm? Avoid jerkiness or harshness. After each exercise, stay present to what is happening in your body. Feel deeply into the aliveness moving through your being. Relax into this flow of being. Micro-manage your movements and responses during the day. Can you move, respond, and maintain your personal rhythm and flow? At the end of the day assess how are you feeling. Before going to sleep, be in neutral and relax into a peaceful place in both body and mind. This meditation is very relaxing and good for the nerves. It pulls you deep into your inner heart/mind space and opens you to go deep into both stillness and flow. Palms are pressed lightly together in front of the face, tips of the middle fingers are at the level of the brow. Upper arms are horizontal, parallel to the ground. Look within at the brow and feel the heart. There is no specified mantra or breath. Simply hold the position and connect within. The breath will regulate itself and become long and deep. Practice for 11 or 31 minutes. Even 5 minutes can be effective when preceded by a kriya, other postures, and pranayama. 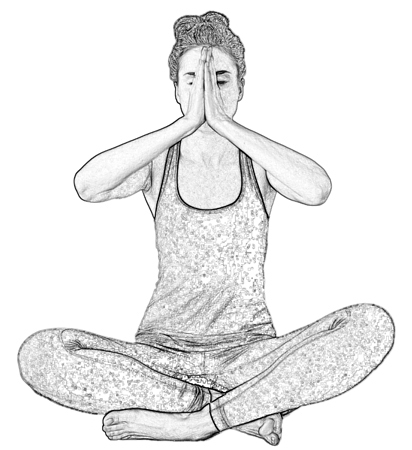 To end, inhale deeply, press the hands together, pressurize the whole body, and pull the locks. Exhale powerfully and repeat two more times. Then stretch up and shake out your whole body. Sit in silence, be in neutral, and feel the alive flow in your body. Be still. Feel the stillness. Listen to the silence. Stillness, silence, and emptiness reveal the secrets of the universe. Below the stillness is an all-pervading aliveness. Below the silence is the heartbeat of the universe. Everywhere there is a pulsing throb of existence. The emptiness is not empty. Energies are coming, going, and disappearing. The essence of existence is a self-perpetuating flow. We find inner peace as our flow merges with the universal flow. Collis, Diana McMahon, Pisces New Moon — March 6, The Mountain Astrologer, February/March 2019, p. 93. 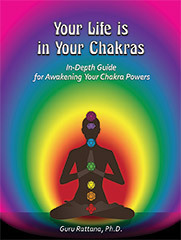 ‘Jod Kriya’ is from Your Life Is in Your Chakras, by Guru Rattana, Ph.D., p. 311, also available as an eBook (pdf). 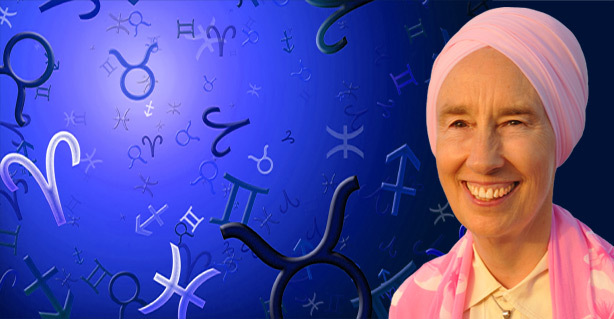 Take classes with Guru Rattana on Pisces and the Flow at Guru Rattana On-line streaming video classes – subscription service . Go to the ‘Emotions/the Water Element’ section for classes Cultivating Your Divine Connection, Pisces Makes Peace, and the Flowing Force.